Dwynwen: Saints and Lovers and Druids … Oh My! 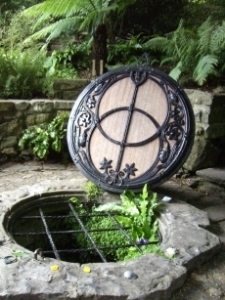 The Chalice Well unites Christian, Arthurian, and Pagan traditions and welcomes all to gather at the Peace Garden in Glastonbury. and a living flow of mystical awareness and love of nature. Bryn Celli Ddu. A 4000 year old cairn which aligns with the Midsummer sunrise, on the Isle of Angelsey, Wales. The carved stone is decorated with a necklace from a recent ceremony. 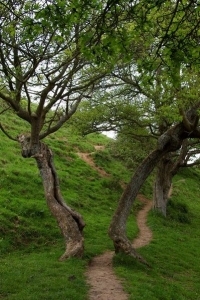 A Celtic weave of branches on the winding path up the Glastonbury Tor. Please call me at 303-415-3755 or email me if you are interested in exploring the Celtic path. I will leave you for now with a poem from Fiona MacDonald and three blessings from the late John O’Donohue. The Chalice Well © 2008 Edie Stone. One of the most peaceful and sacred moments of my life. See note below about the symbolism of the well and well cover. 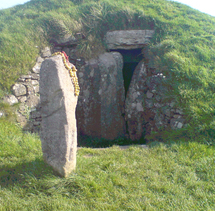 The mound Bryn Celli Ddu, north-east side, main entrance Ynys Môn/ Isle of Anglesey, Wales, by Rhion Pritchard, 2008, public domain. Tor Tree, cc-by-sa-2.0, 2008, Glyn Baker Glyn notes: Tor Tree. Not one of the official concrete paths up Glastonbury Tor but a well worn trail that passes through this split tree, there must be some mystical significance surely? Christian mythology suggests that Chalice Well marks the site where Joseph of Arimathea placed the chalice that had caught the drops of Christ‘s blood at the Crucifixion, linking the Well to the wealth of speculation surrounding the existence of the Holy Grail.